PRO-CC REAR SUSPENSION: The PRO-CC Rear Suspension is the next generation rear suspension from Polaris®. It produces the industry’s best acceleration, handling, and a consistently smooth ride. The rear skid’s coupled design controls pitch through geometry without reducing the fun factor. The front torque arm is calibrated for trail compliance without bottoming. The rear torque arm features a torque link and has an optimized position for Rider Balanced™ Control. PREMIUM WALKER EVANS SHOCKS: Walker Evans® Shocks are race-tested and race-proven, and have improved clicker accessibility for easiest adjustability. The front suspension shocks are Piggyback Needle shocks. The front track shock is a Piggyback shock with a 2 in. diameter for durability and an improved ride, and a performance-enhancing softer spring. The rear track shock is a Velocity Needle shock that features improved oil flow to reduce harshness at top end of the clicker. POWDERTRAC TR RUNNING BOARDS: PowderTrac™ TR Running Boards feature an optimized design for maximum snow clean out while minimizing snow kick-up and maintaining extreme strength. Includes integrated snow skirts. POLARIS MESSAGECENTER GAUGE: Informative and easy to read, this instrumentation keeps a rider aware of sled operating conditions and provides a wealth of additional data. Easily viewable LCD screen, 4.3 in. diagonal measurement, scrolling message center keeps rider informed, increased number of tell tales by over 60%, large buttons can be operated with gloved hands, and brightly lit display is easily readable in all light conditions. 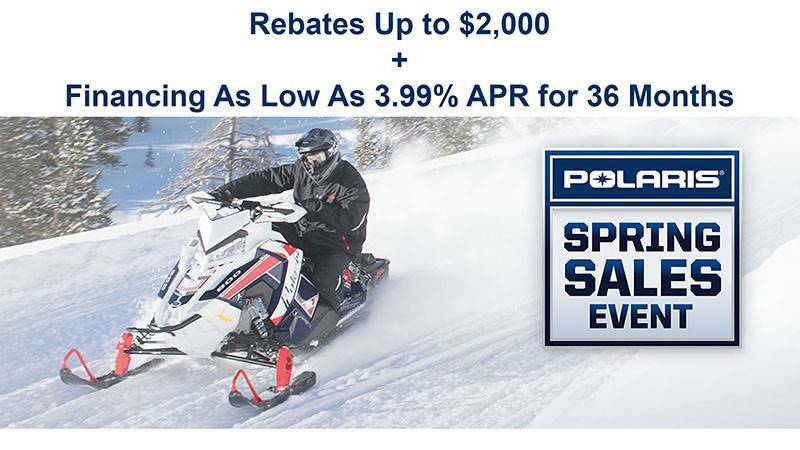 INTERACTIVE DIGITAL DISPLAY: Exclusively from Polaris - the most advanced instrumentation in snowmobiling. This 4.3" high resolution, full color, LCD digital display provides a rider with information including: Sled performance: Speedometer, tachometer, dual tripmeters, average speed, max speed, engine/trip hours & odometer Sled operating conditions: Coolant temperature, diagnostics & maintenance warnings, riding conditions: Air temperature, time of day in 12 or 24-hour clock format, Bluetooth™ functionality: Enables the gauge to communicate with the rider’s cell phone and provide notification of incoming calls or texts. Displays phone battery & signal strength, GPS/Mapping Capability: A compass is standard, & full-featured GPS can be installed to provide directions & information about services such as fuel, restaurants, lodging & Polaris dealerships. Customize the GPS to operate with North Up or Course Up navigation depending on your preference, Ride Planning Feature enables you to plan a ride using Ride Command, save it as a GPX file, and transfer it to the display through the USB interface. SNOW FLAP: Snow Flap enhances cooling with its new design. REAR BUMPER: Rear Bumper delivers improved durability with its integrated one-piece optimized design. Light yet strong, it also provides improved grip. XT HYFAX: Patent-pending Hyfax with a new profile design is optimized for lighter weight while maintaining durability. STORAGE: Storage comes standard on all INDY® 129 models with additional accessory storage options available for greater versatility. Standard integrated underseat storage bag provides 1024 cubic inches of secure storage space with a weather-tight design that seals out snow. Accessory storage solutions are available that install quickly, easily, and securely, and can be used with or without the 2-up seat. TRACK: Ripsaw II 1.25 in. track for ultimate traction on both hard-pack and loose snow.